What do you want from life? To listen to the Tubes? To live long and prosper? To be precise? There's an awful lot of slop, a lot of leeway, a big gray area, and I would never get by without all that margin, without forgiveness and permission and all the rest of the excuses offered by society and humankind. Still sometimes I dream and pine for precision and who can say why? Probably because I can't let go of the notion that somewhere there must be a good and a bad and a right and a wrong; but I live in the interstices, just like everyone else. So what shall we do today, then? Grab your helmet, your tutu and your skates and meet me in the parking lot, we can skate in unison, and strive for precision. Too cute or real cute? 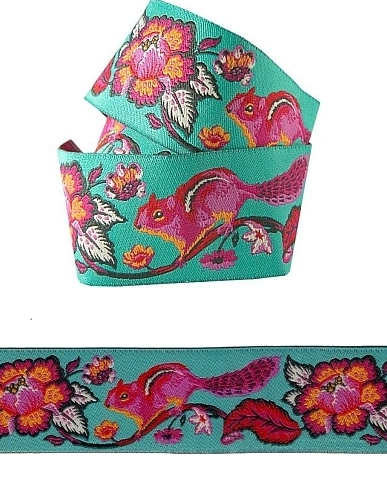 From time to time here at the Dodo we wonder if we have gone too far, so I ask you: Is this too cute? Or does it stay just inside of cute enough to use without crossing over into the dangerous territory of 50 plus year olds in Hello Kitty wear? As I recall Hello Kitty it was a kind of a mysterious exotic thing from the Far East made out of tiny pom-poms, a group of connected pink and white balls- I thought it came out of an oversized gum ball machine at a grocery store in Pasadena, but that seems like it cannot be right. In any case, it was very small, maybe 1.25 inches high, and it was a Big New Thing. This of course was back in the days when cute meant really only very young kids, and you certainly didn't want to be cute if you were over age 7; or, it meant you were being sarcastic and what you meant by the word cute was that you really couldn't stand to be in the room with it. For example: X tosses mud at you, and laughs hysterically, you respond: real cute, X, reeeaal cute. The thing about all this cuteness of course, is that we all weren't really planning for our future- postulating in the late 1970's that Hello Kitty wasn't maybe going to be the right thing for us in 40 years. However, I am going to defend the 50, 60, 70, etc., year olds' right to sport Hello Kitty wear. People often say this or that thing that I am wearing is 'cute' and I always bear in mind that they don't mean it in the way I first understood the word. Although, sometimes I can still hear X laughing. Today I give you a letter from you, to me. All the time, I am reading your letters and thinking "great, so what that you got to go here and do that?" What about me?! You just send me places on the internet, and tell me to do and try things, and you never even call! I give you only the finest; I bring you only what is best and brightest. If you have ever doubted it, I offer these two short films, which are pure puffs of delightful proof. The kite and making it are a study in a kind of poetry of metaphor and potential, and whether it soars or stumbles, the making is a fine time. Begin by making one without any instruction at all- use whatever you have. Drinking straws, chopsticks, twigs, reeds and plastic wrap, old bags, silk chiffon, tissue paper. Then maybe get a book, from the library. You are doing all this with a Someone Else, mind. If you are very lucky, your Someone Else is younger and less experienced in making kites, and you are a Paragon of Patience and Resource. Perhaps some time has passed, and you have learned now that everything 'flies' if you run fast enough with your string: a wonderful thing to discover! Should you find yourself without even the drive to search your kitchen drawer for straws, you could click over this way, and get yourself a kit. The shadow cast by a drawn line. I met an artist this summer who said (of herself ) she was "such a 19th century artist" with a little delighted chuckle at her drawing. At least I think she said 19th, now I worry she might have said 18th? In any event, I took it to mean that she had an affinity for drawing detail and realism. Her drawings were convincing and filled with specificity. Also, and this is where it gets interesting, a quietness. How did that get in there? I don't know. One of her drawings was filled with people and cars, and a giant radio antenna tower, yet is felt as open and calm as meadow with a few cows. Is this how the 21st century looks if you draw it right? Which is related in the usual Dodo round about way, to the image above; of Mary Cassatt's pastel boxes. 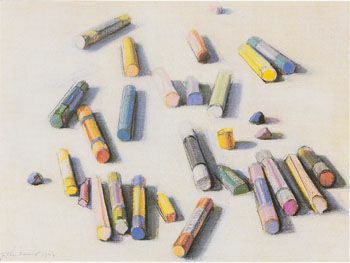 What beautiful cylinders of color! I have many boxes and sets of pastels, and watercolors too, and I buy little palettes of eyeshadow for the same joy in possessing the little slabs of color all in their places. 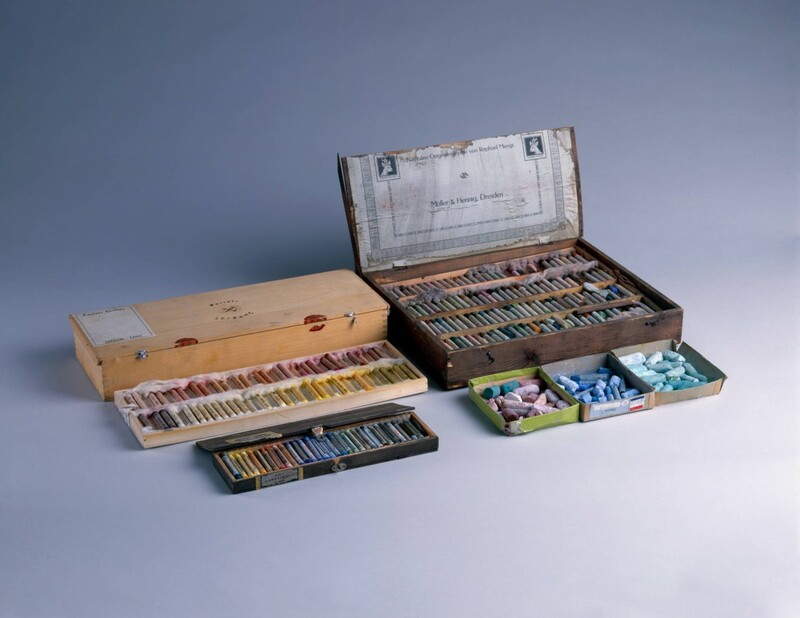 Last summer, at the Georgia O'Keeffe museum in Santa Fe, there were Ms.O'Keeffe's box of drawing things in a vitrine to be admired. It was charming, and compelling, and even a bit haunted in all the best ways imaginable. 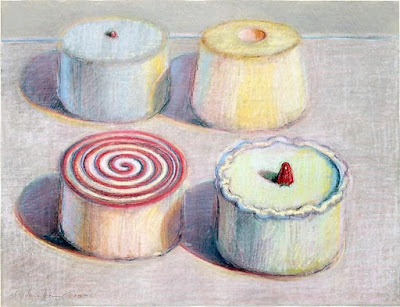 Wayne Thiebaud, Four Cakes, pastel on paper, 1996. * Yes, it would have saved letters to write drafts- vs. draughts- but isn't it fun to dabble in harmless excess? Today's project is to make sugar cookies with your pals- you might object, suggest that summer is not the time for sugar cookies, counter that we wait until the holidays of winter to decorate cookies. Well, ok, wait if you must, but I met a man about a week ago who was practicing already for the dessert he plans to make at Christmas time: Croquembouche. It is a far more ambitious dessert than sugar cookies; Croquembouche is architectural, sophisticated, baroque, and glorious. Cream the butter with the sugar. Add vanilla and salt. Add eggs. Add flour. Refrigerate the dough for a few hours, or overnight. Roll it 1/4 inch thick and cut our shapes. Bake your cookies at 350 degrees for about 15 minutes. Decorate them with the following glaze icing and colored sugar and sprinkles. Sift the sugar into a bowl, add corn syrup, vanilla, & salt: Add milk until you get the consistency you desire.